Faith is being questioned, hope is hanging by a thread, and in the end, an important lesson was demonstrated: This group is stronger and tougher than the sum of its parts. There are two things we don't see a lot of on The Walking Dead. Rain is one of them, starvation is another. It's usually just hot enough for the characters to be coated in a sheen of dirty survivor-sweat that never seems to frizz Maggie's hair. But we don't often see much weather on The Walking Dead. We also don't see a lot of hunger. I think it's safe to assume that everyone's usually eating and drinking just enough to survive, but they always seem to be doing ok. "Them" put weather and hunger together as the characters searched for food and some shred of direction amidst the pain. What's more depressing than Daryl eating a live earth worm? The Walking Dead answered that with a dog feast, complete with the dismal shot of one of the angry dog's collar. Someone's pet got eaten tonight. Bright side: no one got bit by a hungry dog, and everyone got some meat in their bodies, served up hot with a side of misery. 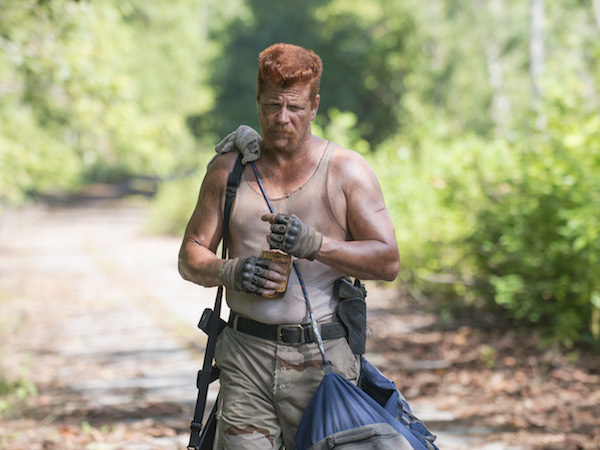 What's sadder than watching Abraham drown his sorrows (and dehydrate himself) with a bottle of booze? Watching Sasha nearly stab Michonne in a rage of zombie killing. You have a right to be angry, Sasha, but get it together and try not to kill your friends. What's more frustrating than seeing Maggie's impersonation of a zombie as she discovers the zombie-remains of a woman bound and gagged in the trunk of a car (seriously, WTF?!)? Watching Daryl burn himself with a cigarette because that's the kind of pain he seems to know how to connect with. What's more hopeless than watching a preacher burn his collar? Hearing Rick's admission that he thinks they're all the walking dead now. "We ain't them" was Daryl's response to that. And I'm kind of with him. As much as I understand Rick's analogy that compares the zombie apocalypse to enemy territory in war, it's a bit unsettling to think that Rick and anyone else he's with might decide to declare themselves dead until this whole nightmare comes to an end. It's essentially the most pessimistic approach they can take. That mentality leaves no room for hope, and without hope, what is there to live for? Beyond that, if they're all just walking dead, what reason do they have to work together and try to survive? If Lost taught us anything, it's "live together, die alone." Maggie, Abraham, Sasha and Daryl were all disconnected from the group at the start of the episode. None of them seemed to want to connect with the rest of them or even try to acknowledge that they're actually friends. But in the end, when push came to barn-door-shove, they joined the effort to keep the walkers out of their temporary safe-haven. It took the entire group (minus Judith, who was left to wiggle on the floor like a baby in The Sims) to keep the walkers out. And fate, or God or pure dumb luck came through on the other side, as the storm took out the trees surrounding the barn, which collapsed on the intruding zombies and somehow missed the barn altogether. These characters deserved a break and they got one. And Daryl fixed the music box. Last week's "What Happened and What's Going On," and tonight's "Them" felt like two additions to the first half of this season. Things were bad, they got worse, the characters stared their pain in the face, and now... something else is about to happen. Enter Aaron, a very clean looking, seemingly harmless man who's clearly been keeping an eye on this group. I think we can assume he's the "Friend" who left a bunch of water on the road for Rick and his people. These characters have met "nice" people before. The Governor had a friendly way about him. And let's not forget Gareth. They're all such nice, welcoming people. Until they aren't. So there's no reason to trust this new guy, but his arrival at the end of tonight's episode suggests that the season is finally moving in a set direction, beyond the vague "Washington D.C." plan. "Them" was a gloomy episode, but a necessary one in laying out the current mindset of these characters before they face their next challenge. With just six episodes to go, things will hopefully be revving up for whatever shocks and twists are ahead as Season 5 of TWD draws to a close.